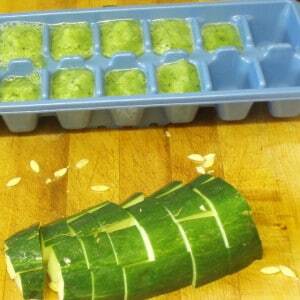 Well – the reason you don’t freeze cucumbers is that it adversely affects the texture. In general, freezing breaks cell walls, and makes a food a little mushy, so it works best with foods you will then cook (which itself does the same thing.) Or – with pureed foods… since pureeing also breaks cell walls and all that… Hmmm, I thought… I mean, most of the time I don’t puree cucumbers, and I specifically do want them crisp and crunchy – but for soup? Or salad dressing? Why not? Flash two and a half weeks later – and I did not have cucumbers! (Not sure how that happened…) But I decided I wanted to do something with the frozen cucumber puree, to test the concept and make sure it did work. And, instead of the soup, I remembered a cucumber mousse – very like the aspic I wrote about earlier this summer. Since I start it by blending the cucumber, it seemed a good use for the puree – and, indeed, it was. So – assuming you usually will start with a fresh cucumber… Cut it in chunks, drop them in the blender, and blend. You will probably have to start and stop a few times, and, while the blender is stopped, poke the chunks down to the blades a time or two. My experience is that they will very suddenly catch and start to liquify (which is one reason not to play around with poking while the blender is running… which is also a good way to get hurt. Don’t do that.) Once there is enough liquid at the bottom, the rest will go smoothly. 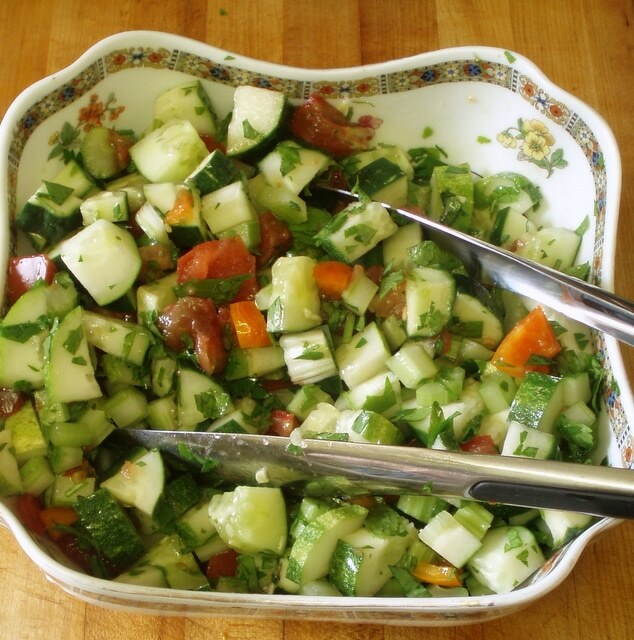 Don’t add water – there is enough liquid in the cucumber, once it liquifies. You want something between one and one and a half cups of cucumber puree. This measurement does not have to be precise, which is good, as cucumbers do not come in standard sizes… we’ll adapt for variation later. If your cuke is huge (as mine was) start with just half of it, and see where you are. If the seeds are mature and coarse, scoop them out first – these were surprisingly small and tender for the size. Take your puree (fresh or frozen) and put it in a fine strainer over a cup. The mousse is set with gelatin, which needs to be dissolved over heat, and you do not want to cook the pulp. In theory, you could just use a little water – I’ve seen similar recipes that call for that – but why dilute the flavor? So, let the liquid drip through the strainer until you have roughly half a cup. (Again, this does not have to be a precise measurement…) Pour that into a small saucepan, and sprinkle one envelope of powdered plain gelatin over it. Let that soften for a few minutes, then heat it gently and stir until the gelatin is completely dissolved. Then take it off the heat and let it cool before adding it back to the rest of the cucumber. Now – cucumbers don’t come in standard sizes, but gel molds do, and even if you are not using one, one envelope of gelatin gels 2 cups of liquid. 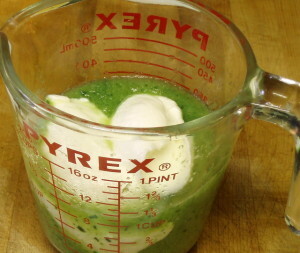 So, put the cucumber puree and the gelatin mixture back into a measuring cup that holds at least two cups. Then add yogurt until the total volume comes to two cups. (I find this much easier and more reliable than trying to measure them separately.) I prefer to make this with full fat Greek yogurt – it is smoother and creamier – but if all I have in the house is nonfat regular, that works, and it is what I used here. 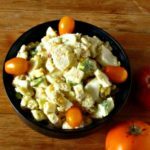 I mixed them a bit roughly, leaving some green streaks of cucumber, as I think that’s attractive… I made sure, though, that there were no streaks of plain yogurt, as that would then not have any gelatin, and would not set. You can also put it all back into the blender, and blend until completely smooth. Now, because this is puree and not just liquid, it’s actually a bit soft for a mold. You might want to just set it in a serving bowl, or in little individual dishes. If you do choose a mold, use a simple one – this will not show off attractive whorls at their best. That said, I did decide to mold it, just for fun. I poured the mixture into the mold, covered it, and refrigerated it overnight. 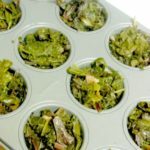 See – one of the great things about all these gelled aspics and mouses is that you have a really nice salad course that you can make ahead of time, without fear of wilting. 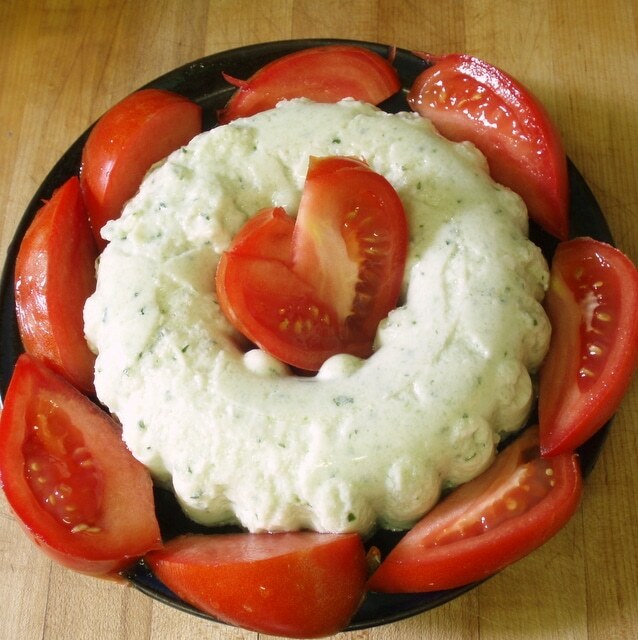 I did not grow up with Jello Salad (well – I did, when visiting one great aunt… but we didn’t eat them at home.) I never thought anything that involved sweetened citrus flavored stuff was a salad (though I have encountered one or two that I did think made a reasonable dessert or snack – a girl in my dorm in college made one I thought surprisingly good, and we’d all snarf it down at midnight during exam week. 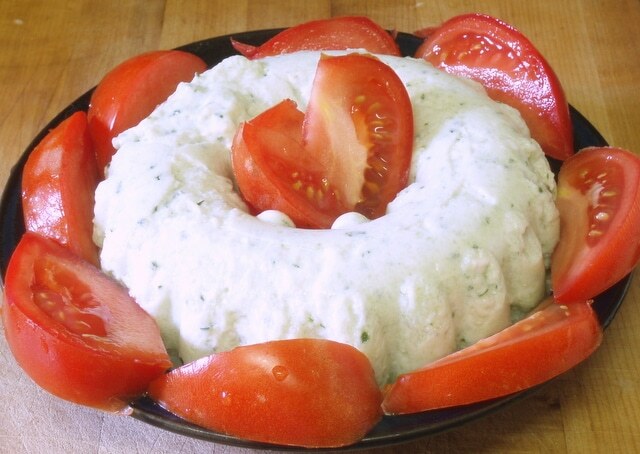 Now, anything involving lime Jello and cottage cheese brings back 19 year olds writing term papers.) But realistically, the make it ahead, carry it in the mold, it’s pretty and doesn’t wilt aspects are all very useful for potlucks and holiday meals, and even just a nice dinner on a busy day. So I made this in the mold, and unmolded it, and decorated it with slices of a lovely ripe tomato… I was thinking that the arugula we’d recently finished would be a nice garnish, or even a bed for it. Rich suggested fresh dill – and if I’d had fresh dill, I would have some in it, so if there was enough, that would be very good. But this was cool and creamy and delicious… I served the cucumber mousse as a separate salad course that made an otherwise plain dinner feel elegant. In really hot weather, this would make a meal of cold meats and beans and salads feel festive, instead of make-do. 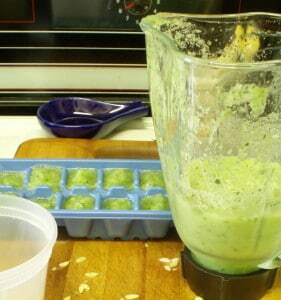 Chop a cucumber and puree in a blender. 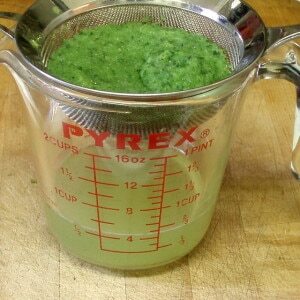 Measure - you need between one and one and a half cups of puree. Strain puree to separate liquid - reserve pulp. Sprinkle gelatin over cucumber juice in a small saucepan - let it soften about 10 minutes. Heat gently, stirring, until gelatin dissolves completely. Let cool. Mix the reserved pulp and the gelatin mixture in a measuring cup. Add yogurt, until you have 2 cups total. Mix. 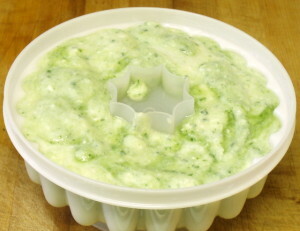 Pour cucumber mixture into a mold or a bowl to set. Refrigerate at least 4 hours, or overnight. Unmold and garnish, if desired, for serving. Could I freeze this mousse? I wouldn't. Gelatin can do weird things when frozen, separates and toughens, and yogurt can go grainy. The texture will be unpleasant. Stick to freezing the pureed cucumbers, and then make the mousse fresh! And enjoy it! Thanks for asking.